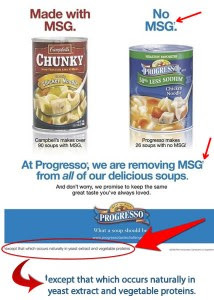 2008 could go down in the annals of advertising escapades as the year of the “soup wars.” I’m not sure who fired the first shot, but by the fall of that year, Campbell and Progresso were flinging slings and arrows back and forth claiming one had more MSG-free soups than the other. If a food contains monosodium glutamate, according to the Food and Drug Administration, that fact must be stated on the label. However, monosodium glutamate is only one of many ingredients containing “free” glutamate (or manufactured glutamic acid) that is used in processed foods. A check of Campbell’s Select Harvest, “No MSG added, 100 percent natural,” Savory Chicken and Brown Rice soup offers a good example of a “clean” label. Using yeast extract, a source of ‘hidden’ MSG, and “natural flavors,” which are typically another place to conceal free glutamate, Campbell’s goes to town advertising the naturalness and ‘MSG free-ness’ of its product. In an interesting aside, the Campbell’s website (which doesn’t list the actual soup ingredients) contains an “ingredient glossary,” to help you “learn more about the ingredients found in our soups.” However while there are definitions for things such as lime juice (“the juice of limes”), and barley (“a hardy cereal grain”), there are none for monosodium glutamate, yeast extract, and natural flavors. Another selling point for some of these foods is the assertion that the MSG, from whatever source, is “naturally occurring,” as in “hey, we didn’t put it in on purpose, it just naturally happened when we added these ingredients.” Don’t believe it. “Naturally occurring” is never defined, and the free glutamate, whether referred to as “monosodium glutamate” or by any other name, was added for the purpose of improving taste and sales. It didn’t get there by accident. In an interesting test (although not a scientific one, by any means) of how many shoppers are avoiding MSG, a large supermarket a few miles from where I live that is going out of business (and reducing all items by 80 percent) had just about been stripped clean of all products last time I was there, with the exception of a full stock of jars of Accent – a flavoring ingredient comprised of pure monosodium glutamate. The “soup wars” may be over, but if you want to be a savvy consumer and avoid all forms of free glutamic acid under whatever name it masquerades, nothing takes the place of reading the ingredient label. Because no matter what you call it, it’s all still MSG. Many consumer watchdogs have found that food label claims such as ‘pure’, ‘fresh’, ‘non-artificial’, ‘natural’ and ‘real’ are largely unregulated and false when these claims are investigated. Moreover, the processing of most foods, ingredients used in manufacturing, their byproducts, waste management and other details are often kept hidden from the public until they’ve been exposed by those willing to publicize the information. 1. The manufacturing of Greek yogurt produces millions of tons of toxic waste every year, and nobody knows what to do with it. 2. All grocery retail orange juice that is “not from concentrate” is processed with “artificial flavor” to ensure that each bottle tastes exactly the same. No matter what time of year and regardless of the origin of oranges, large juice manufacturers like Pepsico are consistently blending perfectly flavored orange juice specifically through carefully controlled processes and artificial flavor calibration. These mixtures are added to replace the natural flavors lost when the juice chemically separates oxygen (“deaerates” ) to be able to maintain shelf life for more than one year without oxidizing. 3. Vegetarian burgers are far more toxic than conventional beef patties. 4. Conventional milk is made by high heating, homogenizing, pasteurizing, re-packing and combining the milk of hundreds of cows fed genetically modified grain and injected with hormones. The food additive “MSG” is a slow poison which hides behind dozens of names, such as natural flavouring and yeast extract. Currently, labeling standards do not require MSG to be listed in the ingredient list of thousands of foods. 7. 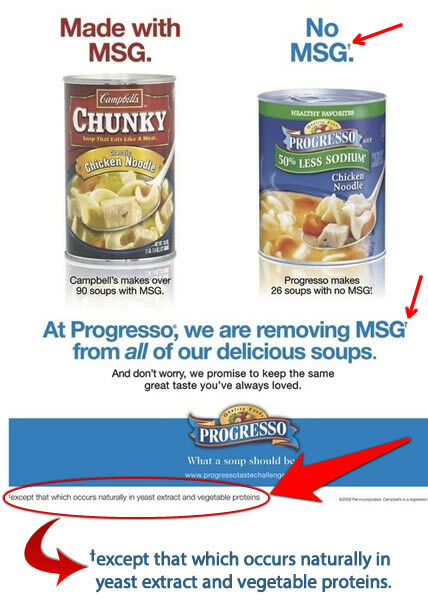 Processed canned soups go through such violent processing that manufacturers must grow mutant sized vegetables so they don’t disintegrate in the soup. 8. Most ice creams are thickened and stabilized with a slew of toxic ingredients. 10. Many olive oils “extra virgin” imported (and expensive) are actually made with cheaper oils of seeds and nuts. To boost profits, for example, some producers have been caught adulterating the oil they label as “extra virgin” with much cheaper hazelnut, soy, or sunflower seed oil, among others, as well as mislabeling its country of origin. 11. Food products that are red and pink are often dyed with cochineal extract, also known as tiny crushed insect bodies. 13. To make bacon, the pork bellies hanging in this strange wash cabinet are bathed in a shower of “liquid smoke”. 14. Shredded cheese is packed with refined wood pulp to prevent sticking. Cellulose made of decomposed plant fibers (including wood) and is a common food additive to make make ice cream creamier or thicken salad dressing without adding calories. Since it is natural, even packaged foods labeled as organic often include cellulose. Mmmmm Sawdust! Yummy. April McCarthy is a community journalist playing an active role reporting and analyzing world events to advance our health and eco-friendly initiatives.